This past week, we saw three theater pieces, each of which had a connection to New York: Red-Eye to Havre de Grace, Act One, and If/Then. Red-Eye to Havre de Grace is a fascinating evening of dance/music/theater that revolves around the final days of Edgar Allan Poe. 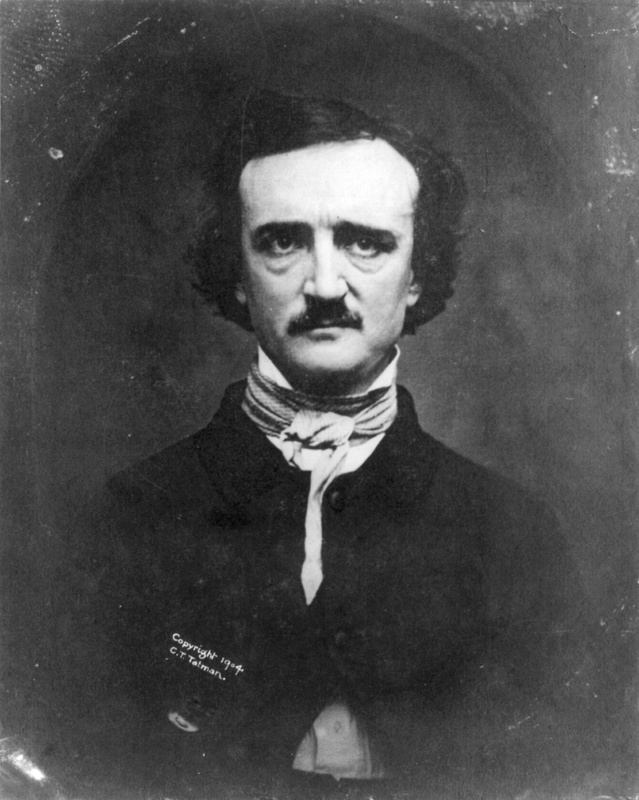 The title stems from the recollections of one of the last people to see Poe alive; though Poe was on his way home to the Bronx from Philadelphia, he somehow ended up in Havre de Grace, Maryland, on a train heading to Baltimore, wearing another man’s clothes. Using Poe’s own writings--from his most famous poem, “The Raven,” to the final work published in his lifetime, Eureka--the four-person cast does a terrific job of (in all senses of the word) journeying into what Poe’s psyche might have been like at the end of his life. There’s also a very funny park ranger. 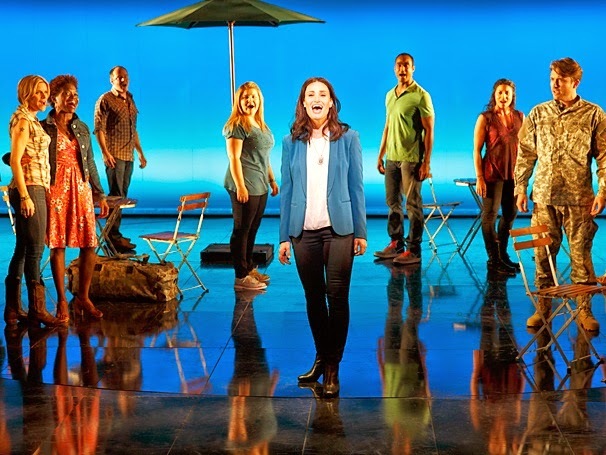 If/Then, from the team who created Next to Normal, is a star vehicle for Idina Menzel (Rent, Wicked). Though it’s a light-weight concoction, we were fascinated that in one of Idina Menzel’s lives--the “if” and “then” of the title refer to the fact that the story bounces between the lead characters two possible fates--she is a New York City urban planner who seems to simultaneously embody traits of Jane Jacobs and Robert Moses. If you’ve read Footprints in New York, you know that we ask the question in our Jacobs/Moses chapter whether the struggle between two such figures is important to urban development. It was intriguing to see that dialectic embodied in one figure...with peppy songs. Both the If/Then score and Menzel have both just been nominated for Tony Awards. And speaking of the Tonys, Act One, playing the Vivian Beaumont, Lincoln Center’s Broadway house, has also just been nominated for five awards, including best play. Act One is based on playwright Moss Hart’s autobiography of the same name. Born in the Bronx in 1904, Hart rose to prominence with plays such as You Can’t Take it With You and The Man Who Came to Dinner, both written with George S. Kaufman. Act One details Hart’s early career, from office boy for a bus-and-truck touring company to his first collaboration with Kaufman, Once in a Lifetime. Playing the roles of Kaufman, Moss Hart (as an older narrator), and Hart’s father is veteran film, television, and theater actor Tony Shalhoub, who does a superb job. Worth the price of admission is the set, a rotating, two-story extravaganza that transports theater-goers from the Harts’ Bronx tenement to Times Square to Brighton Beach and the Broadway stage. Not surprisingly, Shalhoub and set designer Beowulf Boritt are among Act One’s Tony nominees. In honor of our talk tomorrow night (April 25) in Brooklyn (details here if you want to join us), here's a great, early shot of the Brooklyn Bridge, probably from about 1900. Even better than the image is the message. It seems our correspondent, F.W. Haase is responding to someone suffering from digestive problems. 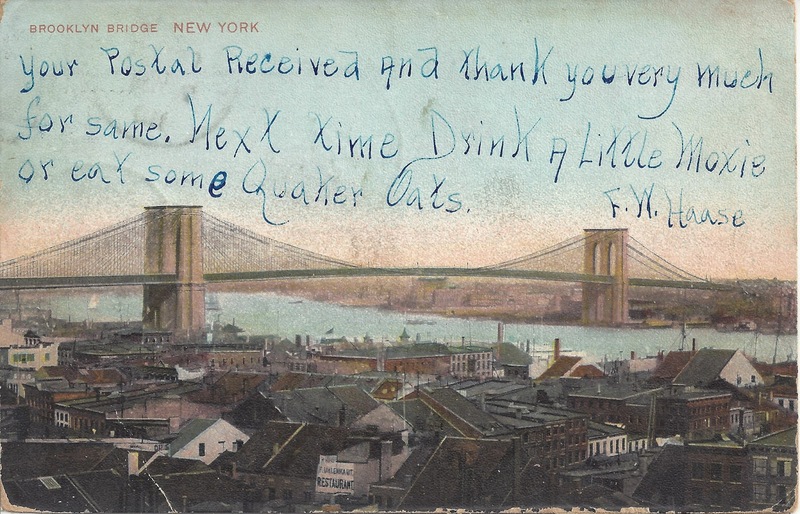 Haase recommends: "Next time, drink a little Moxie or eat some Quaker Oats." 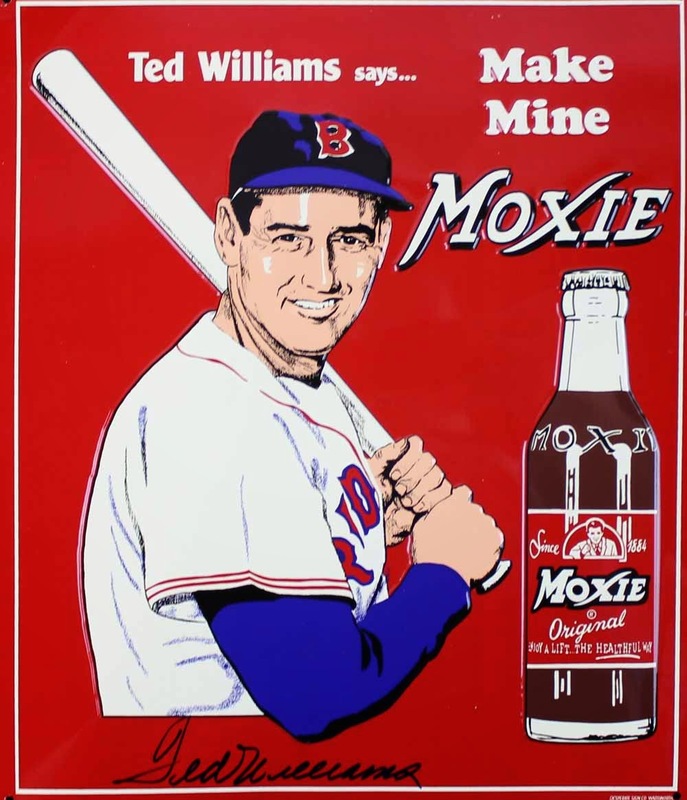 Moxie, one of America's oldest sodas, was first produced as Moxie Nerve Food in the 1870s. By the 1880s, carbonated water had been added, creating the soft drink that it still available--mainly in New England--today. The supposed medicinal properties of Moxie come from the bitter gentian root, which is a tonic and is supposed to aid digestion. The use of the word to mean "courage" or "nerve" is derived from the drink. 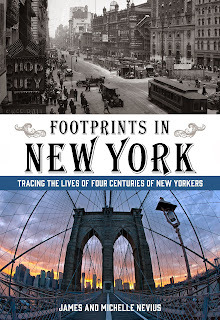 Join us on Friday, April 25 for our first book talk for "Footprints in New York." Join us on Friday, April 25, 2014, at 7:00 p.m.
We are pleased to be the featured authors at the kick-off event for The Salon @ Spoke the Hub, a monthly evening of readings, plays, music, film, and informal performance curated by Chiwoniso Kaitano-Price and Donnaldson Brown. We will be presenting an illustrated talk highlighting some of our favorite stories from Footprints in New York, particularly ones with a focus on Brooklyn's history, from the Dutch colonial era to the unification of the five boroughs. There will be a Q&A following the talk, and books will be available for sale and signing. A cash bar will also be available for libations. More details about this and other upcoming events atwww.footprintsinnewyork.com/events.html. 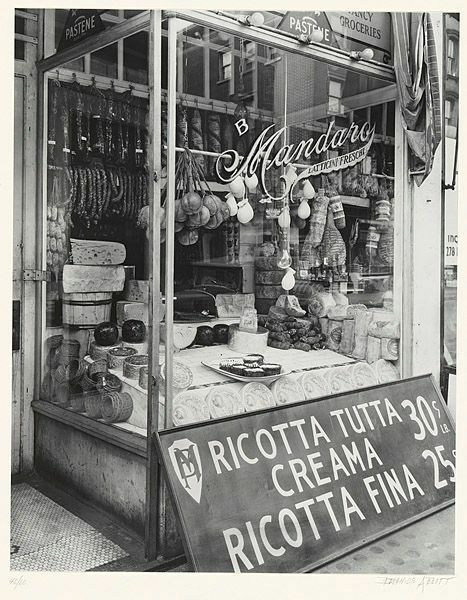 Today's postcard is appropriate for the middle of Passover: a street scene on the Lower East Side, showing vendors and shoppers along Hester Street. The architecture of this block (just west of Essex Street) is very similar to what one sees today. The building at the far right still stands, and the large edifice three-quarters of the way down the block is an elementary school that continues to welcome students. Notice the wood-frame house, third from the right; until 2007, that building (or perhaps a similarly built successor) housed Gertel's, the beloved kosher bakery. After Gertel's moved out, the building was torn down so that high-rise apartments could go up in its place. Around the corner on Essex is one of the only remaining kosher pickle places in the neighborhood, the Pickle Guys (which you've probably visited if you've taken our Lower East Side walking tour). The gregarious owner, Alan Kaufman, was recently on The Dinner Party Download, a syndicated radio program from American Public Media, to talk about the joys--and hazards--of making gallons of horseradish for the holidays. You can take a listen here. 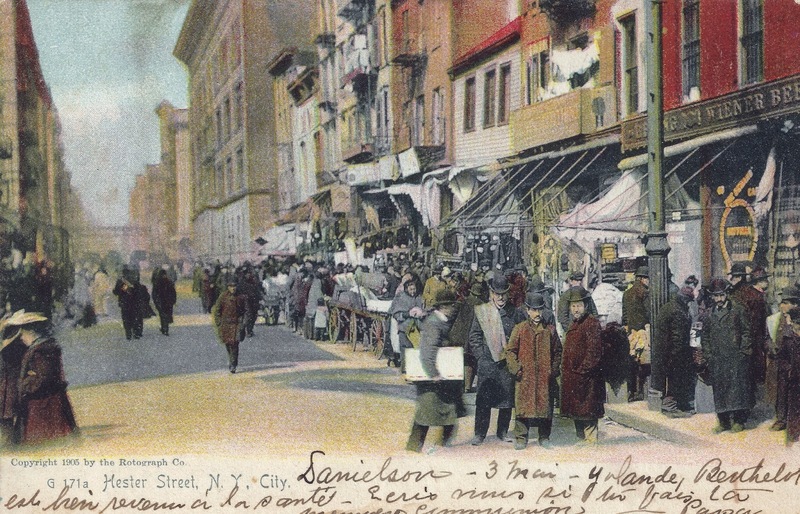 The streets of the Lower East Side aren't this crowded anymore, though if you go on Saturdays to the Hester Street Fair, you can experience the urban, hipster version of what the people in this postcard were doing over a century ago. 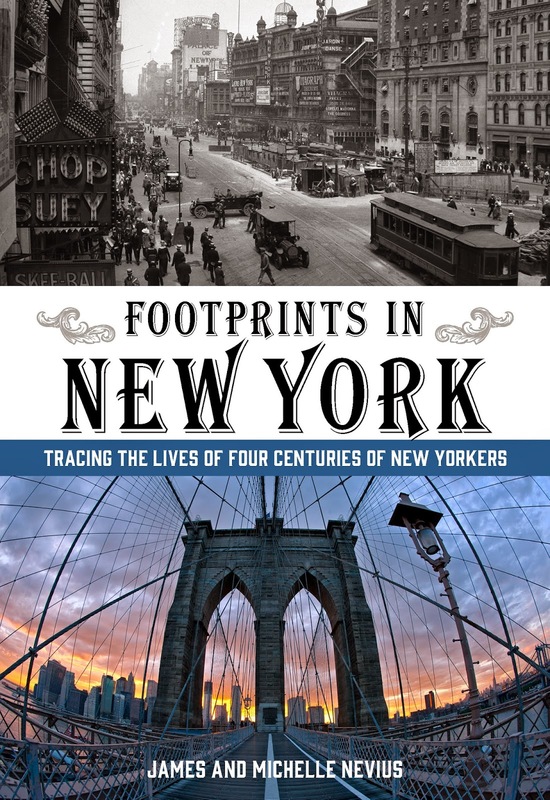 Today is the official release date of our new book, Footprints in New York: Tracing the Lives of Four Centuries of New Yorkers. As many of you know, the paperback edition has already been shipping and on store shelves for over a week. However, as of today, ebook versions are now also available. For Google Play click here. If your preferred ebook format isn't listed above, please search for Footprints in New York on your favorite download site and let us know if it's there! We also wanted to let you know that if you'd like to try to win a free paperback copy of Footprints, Goodreads is currently sponsoring a contest and giving away 10 copies of the book. To enter the contest, go to the Footprints page on Goodreads on or before April 18. There is no cost to enter, but you must be a Goodreads member (which is also free). Good luck! 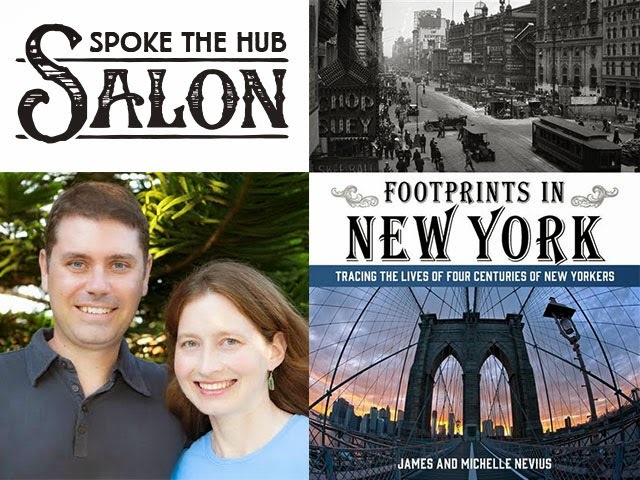 And don't forget that we'll be talking about Footprints in New York at the Salon @ Spoke the Hub in Park Slope, Brooklyn, on Friday, April 25, at 7:00 p.m. You can read more details at http://www.footprintsinnewyork.com/events.html. Hope to see you there or at a walk or talk sometime this spring! Today's postcard takes us back to the Battle of Lake Erie, which was a decisive American victory in the War of 1812. 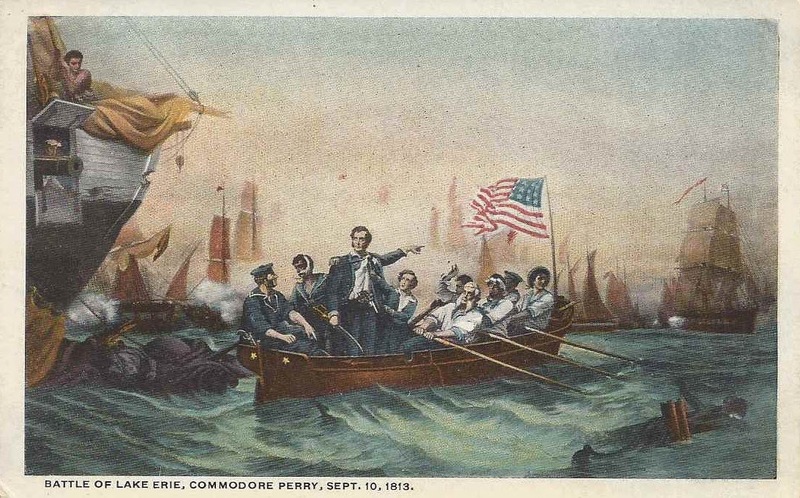 This image shows Commodore Oliver H. Perry transferring his colors from his wounded vessel, the USS Lawrence, to the USS Niagara. After taking command of the Niagara, the British expected the Americans to retreat; instead, Perry pressed the attack, and by 3:00 p.m., the British had surrendered--the first time in history that an entire British naval squadron had surrendered. The figure seated in the boat tugging on Commodore Perry's coat is his brother, Alexander, who was a midshipman on the Lawrence. A third Perry brother, Matthew, also served on the Lawrence that day. He would go on to become a Commodore himself and "open up" Japan (by use of force) to western trade in the 1850s. Today, by the way, is Matthew Perry's birthday--he was born April 10, 1794. Though Rhode Islanders by birth, the Perrys had many connections to New York City. One of Oliver Perry's daughters married John LaFarge, the great painter and stained-glass artist, whose work can be seen around the city. One of Matthew Perry's daughters was the wife of August Belmont, the banker and horse-racing enthusiast who gave rise to the Belmont Stakes. Matthew Perry was originally interred in the churchyard of St. Mark's-in-the-Bowery on Second Avenue, but eventually he and brother Oliver (who'd been buried in Port-of-Spain, Trinidad), were both exhumed and moved to the Island Cemetery in Newport, Rhode Island. Though the postcard above (based on an 1865 painting by William Henry Powell) shows Perry transferring the Stars and Strips to the Niagara, the Commodore's battle ensign was actually emblazoned with the words "Don't Give Up the Ship," the exhortation of his friend James Lawrence, who'd died on June 4, 1813, and for whom the USS Lawrence was named. Lawrence is buried at Trinity Church, Wall Street. Footprints in New York is Out! Great news! Our new book, Footprints in New York: Tracing the Lives of Four Centuries of New Yorkers, is finally out! In Footprints in New York (Lyons Press), the follow-up to our critically acclaimed history of the city, Inside the Apple: A Streetwise History of New York City, we explore the stories of notable citizens of the Big Apple—including Dutch governor Peter Stuyvesant, religious dissenter Anne Hutchinson, writers Edgar Allan Poe and Edith Wharton, urban advocate Jane Jacobs, and musical legend Bob Dylan—and use them to guide the reader through four centuries of the city’s history. One part history and one part personal narrative, the book creates a different way of looking at the city’s past. We are really proud of the finished product and we hope that—just like on our walking tours—you’ll discover things about the city in these pages that you never knew. Some of our walking tour clients even make cameo appearances! If you are in New York City, the book is already on store shelves at Barnes & Noble, the Strand, and other independent stores ahead of its official April 15 release date. If you don’t live in NYC or want to order online, visit our “Buy the Book” page on our Footprints website, which not only has links to Amazon.com, but also to numerous other online retailers both in the USA and abroad. If you want to support your local bookstore, click the “Indie Bound” logo. There, you can enter your zip code and find the independent bookstore nearest to you that has the book in stock or will order it for you. If you are going to be in New York on Friday, April 25, join us for our first book talk. It will be held at The Salon @ Spoke the Hub in Park Slope, Brooklyn. We’ll give a short, illustrated lecture, and afterward books will be available for purchase and signing. You can read more about the talk at www.footprintsinnewyork.com/events.html. We also have upcoming events and walks in Manhattan in the works, so if you want to stay in touch about those, please sign to be on our mailing list or use the "Subscribe via Email" link at the bottom of this post to have these blog entries directly mailed to you when they are published. 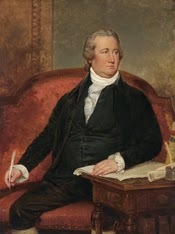 A couple of days ago, we wrote about Frederick Muhlenberg, the first Speaker of House. When Congress first met, 225 years ago, its headquarters was in Federal Hall at the corner of Nassau and Wall streets. Here's a view of Wall Street (not, technically, a postcard) from 1847, showing how the street had developed in the 70 years following Washington's inauguration. Rising up on Broadway is the familiar tower of Trinity Church, which at the time would have been brand new. The building flying the large American flag is what we today call Federal Hall National Memorial. It was also relatively new, having been opened five years earlier to serve as the United States Custom house. It would later become the U.S. Sub-Treasury before turning into a tourist attraction. 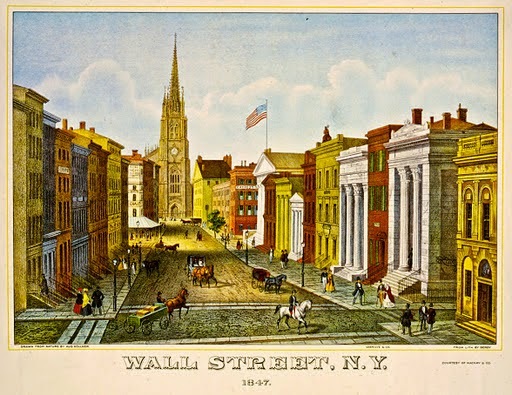 By 1847, Wall Street was the undisputed capital of the city's financial district; the other gleaming marble buildings you see lining the street were banks. However, all was not well in the financial markets: the failure of the harvest in Great Britain sent its economy into a panic, and the ongoing famine in Ireland reached its peak that year, sending over 200,000 Irish immigrants to New York. What a contrast this serene street scene is from the view one would have had of Orange or Anthony streets in the heart of the Five Points, less than a half-hour walk away. The area around that intersection would soon become one of the most densely populated--and poorest--places in the country. This year marks the 225th anniversary of the United States Congress, which began meeting in March 1789 at Federal Hall in Lower Manhattan. On April 1, the newly seated House of Representatives elected its very first speaker, Frederick A. Muhlenberg, a noted Lutheran pastor from Pennsylvania, and the son of Henry Melchior Muhlenberg, the leading Lutheran minister in the United States. Muhlenberg's ties to the city extended deeper than just his time as Speaker. In 1773, he'd been called to be the pastor of Christ Church, the Lutheran parish located at the corner of Frankfort and William streets. (Pace University now stands here, obliterating William Street.) 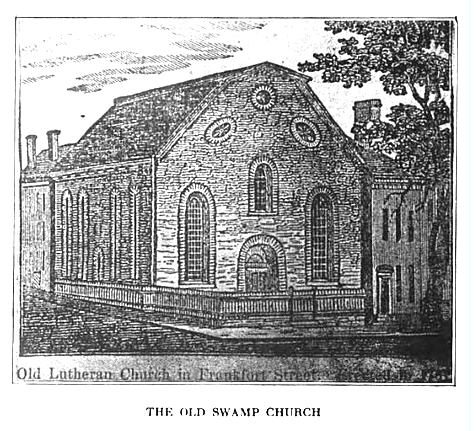 The church, built in 1767, was known as the "Old Swamp Church," a reminder that the area north and east of City Hall Park was still marshy ground in those days. 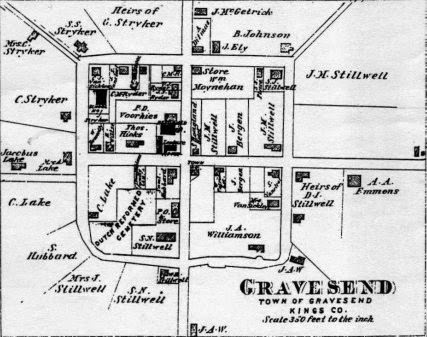 Eventually, the swamp would be drained along with the Collect Pond, giving rise to the area known as Five Points. Muhlenberg's tenure at the Old Swamp Church only lasted two years. An ardent patriot, he fled the city in 1776, around the time of the British takeover of the city. He went on to serve in the colonial assembly, be elected to the House from Pennsylvania, and be honored as first speaker. Muhlenberg also became the House's third speaker (1793-95), and during that time a bill was introduced to have some laws translated into German. The bill was voted down 42-41, and later gave rise to the myth that Muhlenberg cast the decisive vote not to have German be the official language of the United States. However, the bill never had anything to do with an "official language" (which the U.S. has never had) and there's no evidence that Muhlenberg's was the deciding vote. Footprints in New York comes out April 15, 2014, but you can pre-order today from Amazon, and some outlets such as Barnes & Noble are already shipping. Also, it is already on store shelves at the Strand.